The answer to this common patient question is a little more complicated than a simple yes or no. However, if you’re considering dental implant supported tooth replacement, understanding how your dental insurance provider handles these treatments is essential. Dental implants are a great tooth replacement option for almost every patient as they allow your dentist to restore both the roots and crowns of missing teeth. Dental implants last longer than other tooth replacement options, but they also require a larger investment of time and money on the front end. Make sure you discuss all of your treatment options with your dentist before moving forward with any dental treatment options. The cost of dental implants varies based on a wide range of factors including the number of implants, dental implant materials, necessary preparatory procedures, and even your location. The average cost of surgical placement for one dental implant post ranges from $500 to $1500 before the replacement tooth is created and placed. Every additional implant post is typically slightly less expensive than the first. How do Insurance Providers Cover Implants? Some dental insurance plans now include coverage for dental implants, and we hope this trend continues. However, even if your dental insurance provider won’t cover implants, they will typically cover part of the cost of your replacement teeth. Others will provide an allowance that matches the percentage of your restoration that would typically be covered by insurance, and you can use this allowance for any part of the implant process. Talk to your dentist and team about how your specific dental insurance plan may offset the costs of your implant placement. What are Other Payment Options Available? If your company offers a flexible spending account, this is a great option to pay for treatments like dental implants that aren’t traditionally covered by dental insurance. Some dental practices have in-office savings plans that offer discounts on any treatment, including advanced treatments like dental implants. CareCredit is another financing option for many patients. This third party financier specializes in medical and dental financing, and most patients can qualify for low or no interest payments. 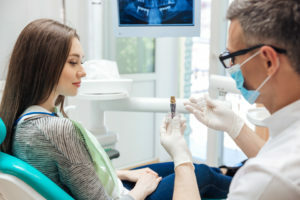 Your trusted San Antonio dentists and team members at New Image Dentistry, work hard to help patients keep their smiles whole and healthy for a lifetime by focusing our treatment plans on preventive care. However, when dental damage does occur, we are happy to provide a wide range of restorative dentistry services, including dental implant supported tooth replacement. If you have questions or want to schedule your tooth replacement consultation, call our San Antonio dental office today. We look forward to partnering with you to create a beautiful smile you’ll be proud to share. Comments Off on Are Dental Implants Covered by Insurance?